Rezaei Alsadi, K., Dejam, M. (2014). Examining the Effect of Dipping Period and Temperature of Hot Water and Packaging Type on Qualitative Traits of Orlando Tangelo Hybrid in Fasa Region. International Journal of Advanced Biological and Biomedical Research, 2(4), 1396-1405. Karamt Rezaei Alsadi; Mahmood Dejam. "Examining the Effect of Dipping Period and Temperature of Hot Water and Packaging Type on Qualitative Traits of Orlando Tangelo Hybrid in Fasa Region". 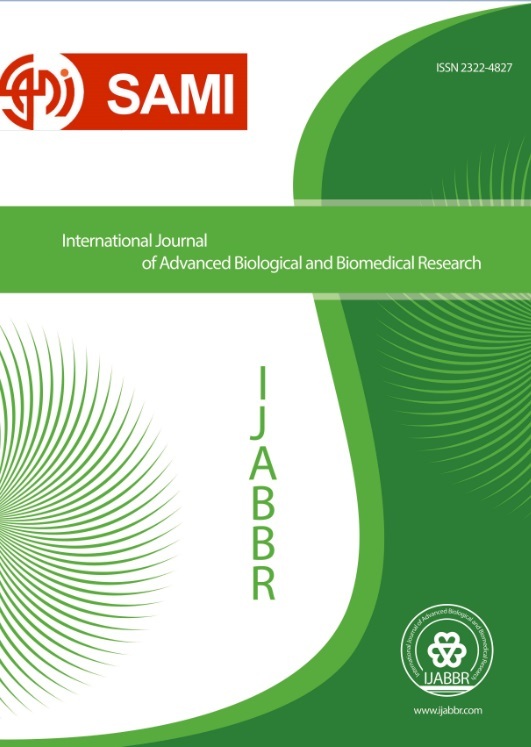 International Journal of Advanced Biological and Biomedical Research, 2, 4, 2014, 1396-1405. Rezaei Alsadi, K., Dejam, M. (2014). 'Examining the Effect of Dipping Period and Temperature of Hot Water and Packaging Type on Qualitative Traits of Orlando Tangelo Hybrid in Fasa Region', International Journal of Advanced Biological and Biomedical Research, 2(4), pp. 1396-1405. Rezaei Alsadi, K., Dejam, M. Examining the Effect of Dipping Period and Temperature of Hot Water and Packaging Type on Qualitative Traits of Orlando Tangelo Hybrid in Fasa Region. International Journal of Advanced Biological and Biomedical Research, 2014; 2(4): 1396-1405. The present study aimed to evaluate the effect of dipping time and temperature of hot water and type of packaging on qualitative traits of Orlando tangelo variety of tangerine. This study was conducted as a factorial experiment in a completely randomized design with three repeats. The treatments consisted of dipping in hot water at seven water levels at 53°C and 58°C each for 1, 2 and 4 minutes. The control treatment consisted of dipping in 20°C water for 2 minutes. Packaging treatment included individual packaging in nylons plastic (LDPE) and group packaging in nylons plastic (LDPE) and not packing the fruits. Such traits as percentage of changes in pH level of fruit juice, total organic acid, total soluble solids (TSS) and vitamin C content were evaluated in this experiment. The results showed that such treatments as dipping in hot water and packaging had significant effects on all measured traits. Minimum increase in TSS was observed in the control group (20°C water for 2 minutes). Maximum increase in TSS was observed in dripping the fruit in 53°C water for 1 minute.